First Book Canada, the non-profit literacy organization, donated its one millionth book of the year at a special reading celebration in partnership with Corus Entertainment on Dec. 14. 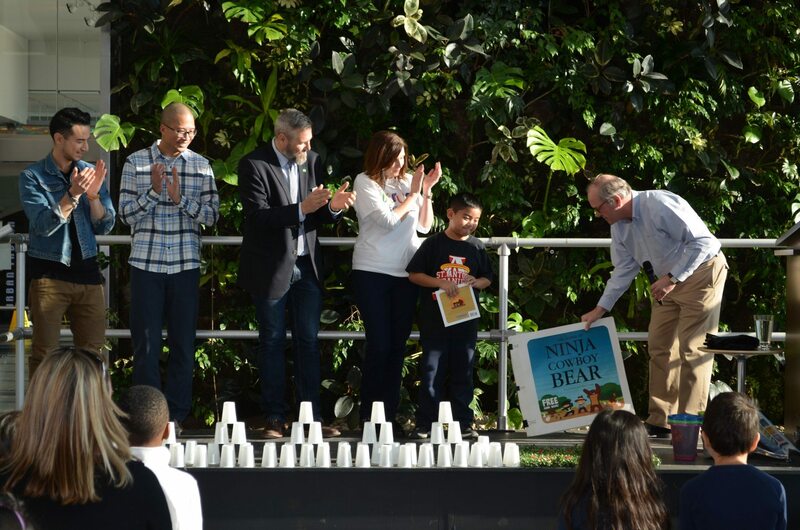 A second grade student from Toronto was presented with Hilary Leung’s The Legend of Ninja Cowboy Bear (Kids Can Press) by Leung, YTV host Carlos Bustamante, and members of First Book Canada, TD Bank Group, and Kids Can Press. It all starts with getting books into the hands of the children who need them most … Literacy is one of the best predictors of a child’s future success. But a child without access to books won’t have the chance to become an engaged and capable reader. We are thankful to our remarkable publishing and corporate partners, who made it possible for First Book Canada to distribute one million new books to children in need this year. First Book has donated more than 4.5 million books to Canadian children in need since 2009.